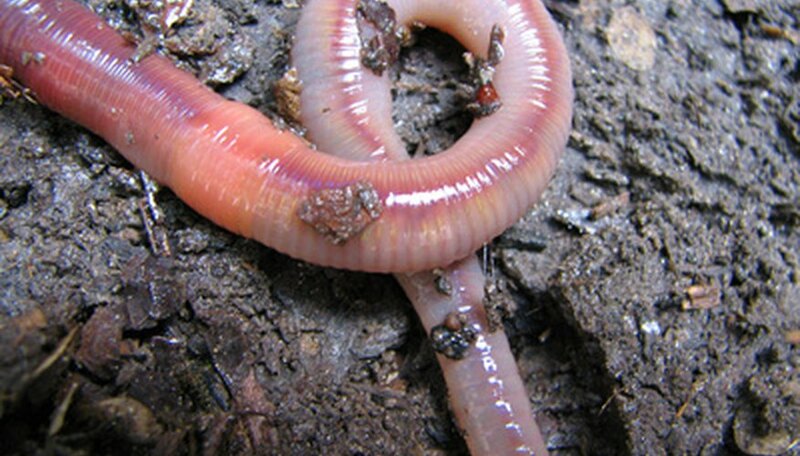 Vermicomposting, a living process, involves special compost worms called red wigglers or Eisenia fetida. You’ll want to pay attention to the temperature of the bedding in your worm bin so that your red wigglers thrive and convert food scraps to worm compost. The temperature of the surrounding environment combines with the moisture level of the bedding and heat given off by organic material as part of composting to determine the exact level of heat or coolness. Use a soil thermometer or compost thermometer, available at garden centers, to measure worm bin temperatures. Temperatures above 84 degrees F could prove harmful to the worms, Appelhof writes. She notes that bedding kept moist will be cooler than surrounding air because the evaporation of moisture from the bedding has a cooling effect. Locations likely to become too hot include attics, areas outside in the sun or high elevations in a greenhouse, she writes. Munroe states that worms will try to leave an area that hits 95 degrees F, and if they cannot leave, they will quickly die. “The Worm Book” notes that temperatures above 80 degrees F will greater slow down the worms’ composting activity. Red wigglers can survive northern winters outdoors if they are kept in a pit dug in the ground and covered with manure, straw and leaves, or a proper plywood lid insulated with rigid foam, Appelhof indicates. Munroe notes research showing that worms can survive freezing for a short while and that worm cocoons will survive below-freezing temperatures and hatch even if the parent worms perish. Compost worms react to temperature differentials within their bedding by redistributing themselves within their bin or pile. If you use compost such as manure or food scraps, which release heat as they decompose in an outdoor bin in the winter, the worms will place themselves in a band at a distance that is comfortable for them. If you place frozen food scraps in your outdoor bin on a hot summer day, they will similarly seek an optimum depth and temperature, not too cold or too hot.